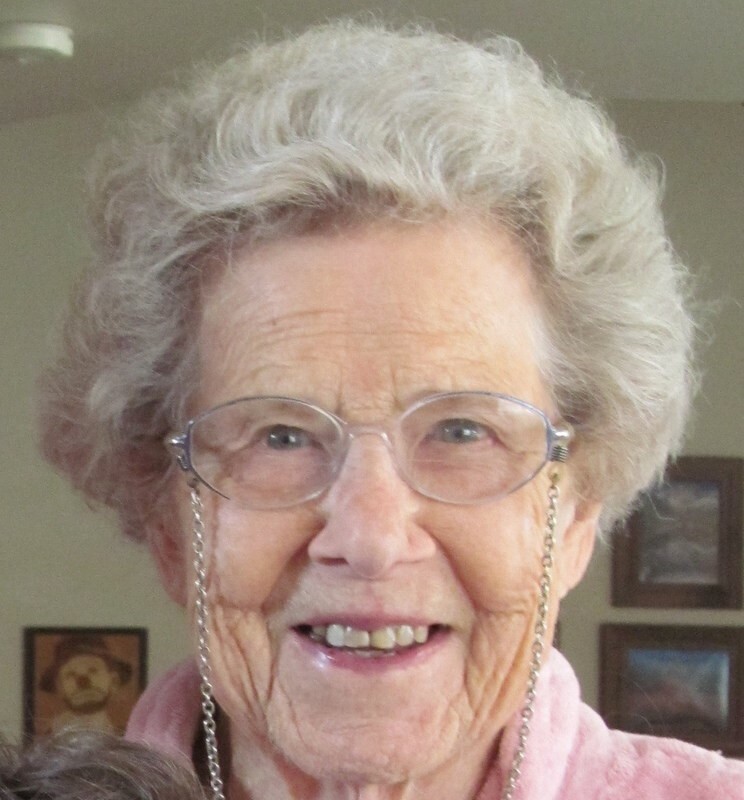 Rosemary (Wall) Taylor, 92, formerly of Richwood, died peacefully on January 13, 2018, at St. Francis Medical Center in Colorado Springs, CO.
She was born April 18, 1925, in Richwood, to Lester E. and Hester M. (Kuntz) Wall. Preceding her in death were her husband, Raymond Lowell Taylor; a daughter, Katie Sturgeon; and a son, Thomas Matthew Taylor. Rosemary was retired from Richwood-North Union Local Schools, where she taught high school Spanish and English for 25 years. Following her retirement, she moved to Colorado and soon became active at the Colorado Springs Senior Center, where she was a leading member of the “Mountain Mamas,” a singing and dancing group which entertained extensively in the Pikes Peak region and throughout Colorado. She also enjoyed participating in various ballroom, tap, folk, and square-dancing groups. A lifelong Catholic, she found strength and comfort in her faith and in her relationship with Jesus Christ; as a member of the Anglican Church, she served on Altar Guild and the parish Vestry. As a wife, and mother of eight children, Rosemary was intimately involved with her family. It meant the world to her to see and to hear about all the activities of her children, grandchildren, great-grandchildren, and extended families. She loved her many friends, a good joke, chocolate, playing cards and Rummikub, working crossword and Sudoku puzzles, singing, dancing, and playing the piano. Surviving are her children: Fr. Nicholas Taylor of Colorado Springs, CO; Rosanne (Bob) Sturgeon of Divide, CO; Beth (Bill) Brelsford of Prospect; Fred Taylor, of Crawford, CO; Lodi (Nancy) Taylor of Prospect and Bill (Suzie) Taylor of Winter Park, FL; 10 grandchildren and 21 great-grandchildren. She is also survived by her four siblings: William K. Wall, Anabel Sult, Nicholas J. (Dottie) Wall, and Dr. Lester E. (Shirley) Wall. A Requiem Mass will be celebrated Saturday, June 9, 2018 at 10:00 a.m. at St. Paul’s Lutheran Church, 930 Harding Memorial Parkway, Marion. Interment of ashes will follow at Chandler Cemetery, Marseilles. Afterwards, a reception for family and friends will be held at the home of Matt and Sara Taylor, 31231 SR 37, north of Richwood. So sorry to hear of your family's loss. Prayers going to the family. Fred & Family: I’m sorry for your loss. Of all the many teachers throughout my years, your mom always had a smile wherever I would see her. Prayers to all you during this difficult time. Sympathy to the Taylor family. So sorry for your loss. Sending our sincere sympathy for your loss. Your mom was such an outgoing and delightful woman. Had an opportunity to talk with her afew years ago when she was back visiting. Such a happy picture of Mrs. Taylor was on the Stofcheck-Ballinger website! That is how I remember her too. She was always a happy person. When I was her student in Spanish from 1972-1973, I earned a C for the year. Clearly, other languages were not in my toolbox at that time. Years later, I often thought of Mrs. Taylor because I worked in the Dominican Republic opening a new mission field there. It shocked me to remember as much Spanish as I did! I got along at least half-way well. And it was all thanks to her. I often wanted to tell her this, but didn't know how to reach her. At least you can know. Also, she was our class advisor in 1975 when I was Junior Class President. She launched into the work. So at the banquet, I was privileged to give her a bouquet of flowers and a kiss on the cheek. Just for the record, I became a pastor as an adult and even headed up our denomination for some years working in over a dozen countries around the world with our missionaries there. I will always be grateful for Mrs. Taylor's investment in my life--even when the grades didn't show that it took very well at the time. Thank you and may the Lord bless each of you in the family through this time of loss. To Rosemary's entire family. On behalf of NU Class of 1968 and we also remember our classmate Katie, please accept our deepest sympathy. May God watch over you all during this most difficult time. To the family of Rosemary Taylor, So sorry for the loss of your beloved Mother, Grandmother, teacher,best friend, Great-Grandmother, disciple of the Lord, and whatever she was to so many different people, May God wrap His loving arms around each of you and give you comfort, peace, love, and understanding! God Bless!